The Rehoboth Lions Club will honor people whose service to the community has surpassed expectations at a RECOGNITION NIGHT BANQUET to be held on Wednesday, MAY 9, 2018. Click here for a copy of the nomination form. The Rehoboth Lions Club was formed June 5, 1957 under the leadership of our beloved George Sarkisian (deceased). The Club received the guidance and council of members from the Taunton Lion's Club, particularly Vin Makin who continued to support the Club for many years. There were 23 members attending the charter meeting at the Goff Memorial Hall. In 1957, Rehoboth Lions club offered tea bags as an option in the sale of light bulbs. The 1957 sale was a success, bringing in nearly $600, and provided the means to launch the Club's charitable and community services with full financial support of an eye operation for a young Rehoboth girl. The Club sponsored the Seekonk Lions to obtain their charter. In recent years, that support to other clubs has been renewed with the sponsoring of the Rehoboth Anawan Lions Club and this 2012 year co-sponsoring the new D-R Leo Club for our High School students. 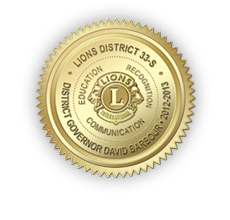 Today, Lions of Rehoboth has over 60 active members and are part of Massachusetts District 33-S. Some of our highlighted projects include the Annual Chet Munroe Chicken BBQ; the Annual Rehoboth Citizen's Recognition Night; our famous Clam Boils held at the Seekonk Gun Club; and so much more. Interested in joining us? Click here for a membership form; or, just ask a Lion!